If you’re reading this blog then you’ve probably already decided on getting an UPPAbaby stroller, as they do offer a selection of some of the best lightweight strollers. The UPPAbaby G-Luxe and G-Lite stroller, specifically, are part of UPPAbaby’s line of lightweight umbrella single strollers designed to make transporting your child easier and more convenient. But which one should you choose? Is the G-Lite or the G-Luxe a better fit for your family? What is the difference between them? Peppy Parents did the research already, so here are the differences and similarities between the 2018 UPPAbaby G-Lite and G-Luxe strollers. First, let’s start with the similarities. These two strollers were designed to make life a little bit easier when it comes to travelling and running errands with your baby. All-wheel suspension, ergonomic handles, washable and stain-resistant fabric, and a convenient carry strap rounds out the sleek and innovative design of both the G-Lite and the G-Luxe. They were truly made to be a parent’s best friend when the family is on the move. For safety, both strollers have a five-point harness and a multi-panel canopy to provide UPF 50+ sunshade protection. You can extend or push back the canopy to let the sun shine brightly on your child or protect them from harsh and hot sunny days in the summer. The straps are adjustable so that as your child grows, the harness grows with them. 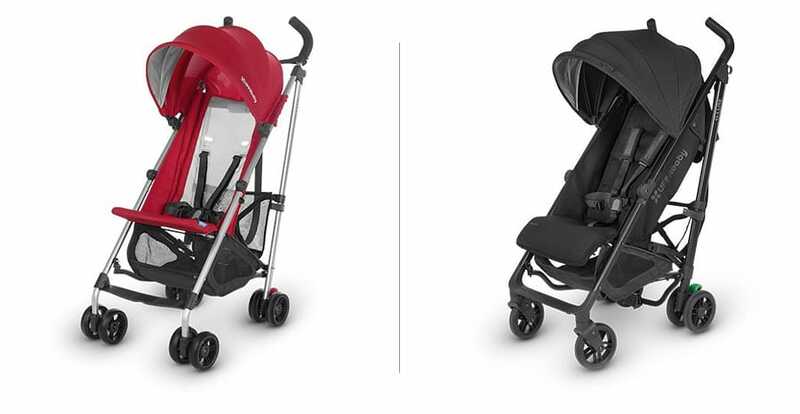 When compared side-by-side, the biggest difference between these two strollers are the features and not the size. Overall, the G-Luxe just feels a bit bigger. While it is heavier, a close look at the dimensions reveals that the actual difference in size is negligible—a half-inch wider, less than an inch taller, and almost 2 inches shorter than the G-Lite. While both strollers boast a maximum weight capacity of 55 pounds, the G-Luxe is approved for use for infants 3 months and older, while the G-Lite requires babies to reach the age of 6 months to be approved for use. So, what gives the G-Luxe its luxury feeling? In our opinion, it’s the seat, one-handed recline, and larger wheels. The G-Lite has a mesh seat back—the breathability of the mesh helps keep your little one cool and also allows for the stroller’s compact fold. The seat on the G-Lite reclines, a feature added by UPPAbaby when it redesigned the 2018 model. We are really excited about this update as it is an important feature we felt previous models lacked. Compared to the G-Luxe, the recline feature still isn’t as robust, but we wouldn’t expect it to be. It’s a zip recline function, so not the most convenient to use, but when your little guy or girl falls asleep unexpectedly, it’s nice to be able to recline the seat for a more comfortable nap. In comparison, the seat on the G-Luxe is a bit more luxurious. The fabric seat is padded for additional comfort and boasts an adjustable footrest. While the seat also reclines, this feature is more robust than on the G-Lite model. The seat reclines with the use of a trigger that can be operated with one hand. If you anticipate lots of naps in your stroller, the G-Luxe definitely wins in this department. Finally, the G-Luxe rides on slightly larger wheels than the G-Lite. The wheels on the G-Luxe are 5.5 inches in diameter while the G-Lite’s wheels are 4.7 inches. These additional features correspond to a five-pound weight difference between the strollers. The G-Luxe tips the scales at 16.3 pounds compared to the G-Lite which weighs in at 11.2 pounds. When deciding which one is right for your family, consider the age of your little one and how you plan to use your lightweight stroller. Are you planning to use the stroller for your infant? If so, the more robust seat recline and approved use for infants 3 months make the G-luxe a good choice. Are you replacing your full-size stroller for a smaller version because your child simply doesn’t need a stroller as often? Or is this a secondary stroller for quick jaunts? The G-Lite may be a more economical choice. If you’re shopping for the best lightweight strollers online, the 2018 UPPAbaby G-Lite and G-Luxe are not to be overlooked. Peppy Parents has both models available online, and our products usually ship within one business day. For questions about UPPAbaby’s line of lightweight strollers, contact us through our online form.